my friend referred me to this place, saying there was a board where I could post indie content. I asked him if he was sure he meant non-Nintendo games, as that seemed too convenient to be true. But he was fairly certain, and I checked the thread stating what this board was here for, so here you go. 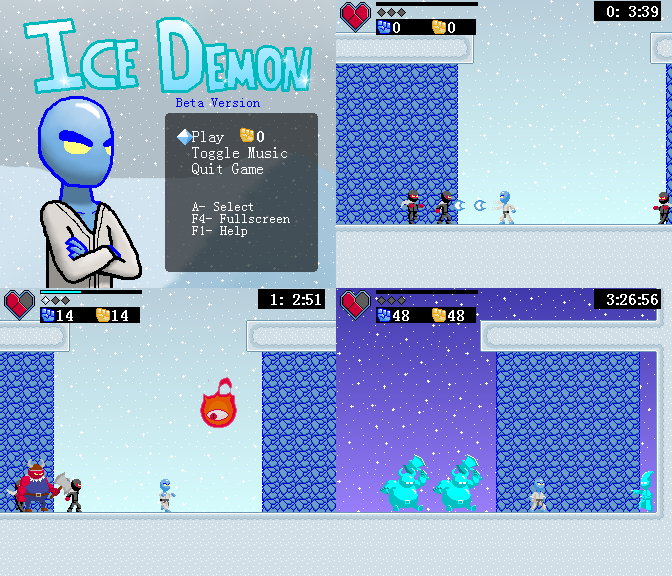 Ice Demon is a minigame where you simply beat up as many attacking enemies as you can before you die. Hopefully you like a challenge, because the game can take some practice. Good luck! Although it's a full game, there's still more to come in newer versions, such as stages and gameplay modes. There's a glitch I didn't quite catch before getting this compiled but I have reason to believe that you wouldn't be able to find it unintentionally. See the readme for details. Can we have a dl link? (10-28-2011 03:41 AM)rcmero Wrote: Can we have a dl link? It should be there, I put in "Enjoy" as a hyperlink.